When you start Insight, the first thing you will see is the DUG Insight Launcher. The following are steps to launch an application from the launcher. Note: Multiple instances of an application can be launched and run at the same time. For example, if you click on the Launch button three times, three separate instances of Insight will open. This will have an impact on memory usage. Open DUG Insight Launcher by double-clicking the icon or, on Linux, running Insight from a terminal. Click Open Project to open an existing project directory or Create New to create a new project directory (see Opening an Existing Project or Creating a Project). By default, Insight will select the most recently used project so that you can quickly go back to the same project where you have last worked on. To configure the settings of an existing project, including project CRS, datums and backup settings, click on the spanner icon (see Configure a Project). After selecting or creating a project directory, choose the appropriate application to launch. Insight uses a proprietary data format to improve performance and functionality. 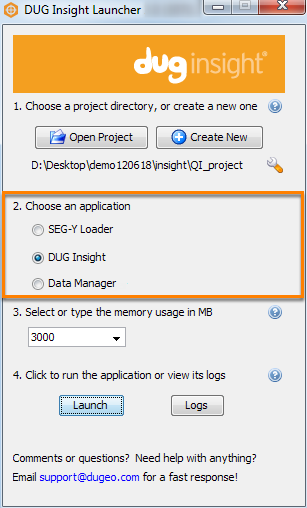 SEG-Y Loader helps you to import SEG-Y data into the DUGIO format used by Insight. It is a wizard-based application in which you can load multiple 2D lines or a single 3D volume at a time. Each step of the wizard includes instructions along the left side. See Launching SEG-Y Loader for more information on this data conversion tool. To launch Insight, select DUG Insight. Most of the software features are found in the main Insight application. A tool to manage your project database. For more information about the tool, see Launching the Data Manager. Type or select the amount of memory that can be used by the application. For an explanation of how Insight utilises memory, click on the question mark on the right. For more information, see Allocating Memory. Click Logs to view the diagnostic logs or to send it to DUG (see Viewing and Sending Diagnostic Logs). When you are ready to begin, click Launch to run the selected application.